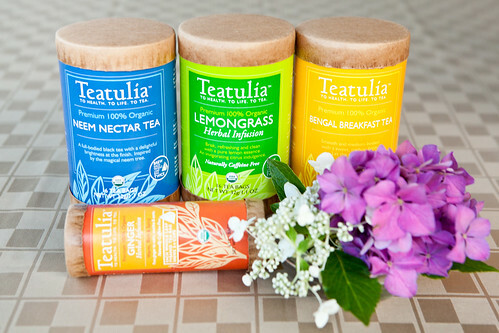 Teatulia is named for the region in Northern Bangladesh where this company’s tea is grown. Their teas are simple, clean, delicious teas that does not have any additives since that region cannot afford to add chemicals to anything. (If you look at Teatulia’s YouTube video on their “About Us” page, you know what I mean.) What is great about this tea company beyond selling fresh and tasty teas, the company has a social mission to give back to their community with education, health and cattle-lending programs for the people working in the garden and surrounding areas from the sales of their teas. This creates a better living environment for this tea-growing area of Bangladesh for the men, women, and children. Going back to the teas, I was enamored with Teatulia’s lemongrass tea, which just been awarded for a Sofi Award this past June. Clean, fresh, citrusy with a touch of zing. Whenever I get obsessed with a flavor, I can’t stop thinking of how to create a dessert out of it. After some talking out loud on my Facebook page and Twitter, I eventually thought of making panna cotta with it. I think it’s the most refreshing sweet to eat in the hot summer and it’s not so tedious to make and toil over a hot oven so this makes for an easier sweet – without being too sweet. I played along the tropical flavors of the lemongrass by pairing it with a golden kiwi gelée. 1. Bloom the gelatin in a small bowl by adding 1-1/2 teaspoons water. Set aside. It should look like an hard, translucent yellow gel. 2. While waiting for the gelatin to bloom, heat the heavy cream and sugar together in a small saucepan until it starts to simmer. Add the lemongrass tea and cover. Set aside for at least 1 hour to steep. 3. Strain the cream and tea mixture into a large clean bowl. Discard the tea leaves. Pour the strained lemongrass tea cream mixture back into the saucepan and reheat until barely simmering. Take off the pan from the heat and add the bloomed gelatin (from step 1) and stir with a whisk until it completely dissolves. 4. Take your dessert glasses (I used stemless Champagne flutes, shot glass, and a miniature version of the highball glass) and carefully add the warmed lemongrass tea cream mixture*. 5. Bloom the gelatin like step 1. Set aside for 3-5 minutes. 6. Place the kiwi, water and sugar into a clean saucepan. Stir the mixture until the sugar dissolves and turn off the flame. Place the heated mixture into a blender and purée until smooth. Pour the puréed kiwi into a small bowl and stir in the bloomed gelatin (from step 5). When cooled to about room temperature, pour the kiwi mixture into the panna cotta glasses and refrigerate until set (about 1-2 hours). Serve and enjoy. *Note: If you want to create multiple layers like I have, stop about a third way up the glass and refrigerate (or freeze to make it faster) until set. Pour in your slightly warmed kiwi gelée mixture and place it back in to the refrigerator until set. Add the remaining re-warmed lemongrass tea cream mixture and let set inside the fridge. Finally top it with your remaining re-warmed kiwi gelée mixture. Refrigerate until set (about 1-2 hours). Serve and enjoy. Quite a good refreshing treat for summer. I’ve had one of these panna cotta a year ago and I was truly amazed by the taste of it. It’s delighting. 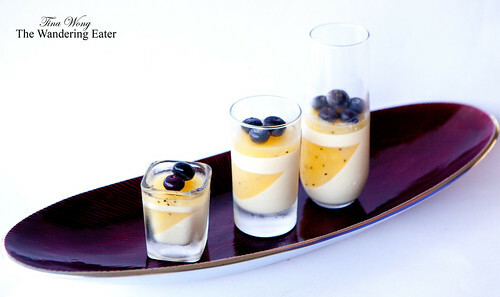 Gorgeous photos (found your blog through Foodgawker) and what a fantastic idea for panna cotta – thanks for providing the instructions on the layered gelee. Gorgeous! Claudine: Thanks for visiting and the compliments! Glad to know that you found my instructions useful.